The torrential rains after months of drought has resulted in severe floods in almost 19 administrative districts in Sri Lanka, hampering the lived of thousands. The worst scenario had been the landslides in the mountain regions where still many lives are unaccounted for. Sarvodaya, in partnership with the Voice of Asia Media Network (Siyatha TV and Siyatha FM) has taken immediate steps to provide relief to the affected people. 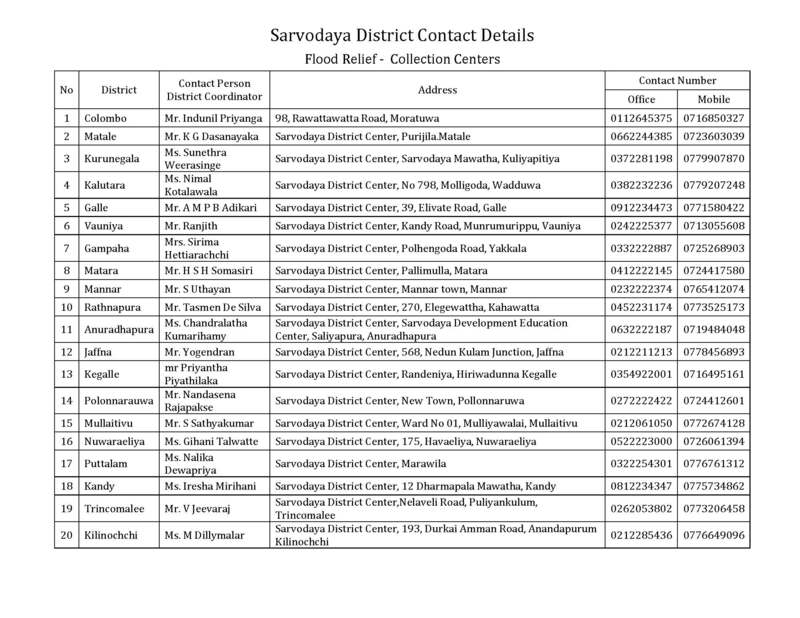 Twenty Sarvodaya District Centers are designated for collection of relief items including water bottles, milk powder, dry rations, and sanitary items, and the first arrivals are expected by early morning of Thursday the 19th May. The efforts to dispatch the first truck load of portable water to Pahathgama in Hanwella failed this evening due to inaccessibility of the site via road. The transitional site has to be reached with 1 kilo meter boat ride after the last point on ground. Sarvodaya, along with the Voice of Asia Media Network appeal the Sri Lankan and International friends to join with them at this difficult times of floods 2016. The information of the Collection Points are as follows.